Conductive tracks on a circuit board are usually hard printed on the board. 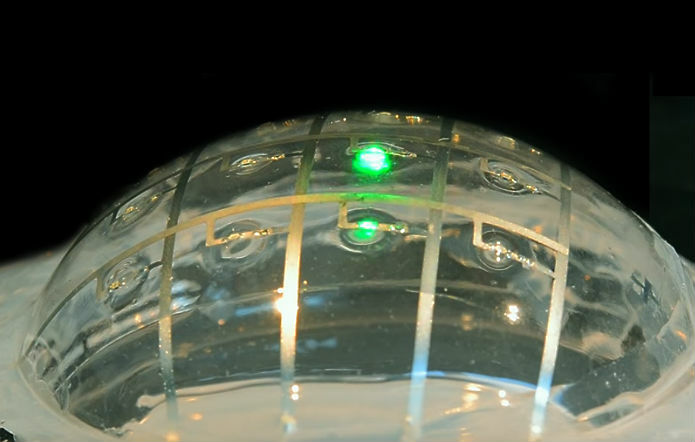 But the circuit boards recently developed at EPFL are almost as flexible as rubber and can be stretched up to four times their original length and can be stretched a million times without cracking or interrupting the conductivity. Looking to the future the potential applications are of a wide-range with everything from general electronics in vibrating machines (that can cause electronics to flex and bend if vibrations are not isolated properly), to more Sci-Fi inspired things like artificial skin on a robotic limb, skin on a soft robot, and electronic clothing. Extensive research has gone into developing an elastic electronic circuit. Components traditionally used to make circuits are rigid, so going against this convention is a real challenge. The scientists chose gallium as part of the alloy because it maintains good electrical properties and stays in its liquid state, even at room temperature. The video below shows a couple of examples of the material’s flexibility. In lab tests the liquid metal circuits were put through punishing tests to prove it’s durability.